The Gambia allowed me to spot my first real signs of wildlife. The species I spotted the most often was the green vervet monkeys like the ones in the photo below. I sighted these monkeys both in Abuko Nature Reserve as well as here in Bijilo Forest Park. The green vervet are easily the most friendly of the monkeys I’ve spotted so far. I’m told this is a combination of the fact that tourists feed these monkeys peanuts and that the much shier red colobus monkeys were once hunted pretty heavily as bush meat, making them obviously wary of humans. The photo below was taken of a troop of vervets that were very active and dancing around in really great light for me. This mother actually had two young that it was taking care of. The babies were much more nervous of my sight, but the mother seemed to console the young whenever they seemed frightened. I was really lucky that the monkeys were at my eye-level. Generally, when photographing monkeys you’re shooting up at them which makes for awkward angles unless you’re willing to climb a nearby tree and stakeout. As is the case with photographing humans, try your best to center your focus around the eyes of your subject. I wanted to make the baby the focus of this image so I focused on its eyes. I also shot a very shallow depth of field (f/2.8) so that there would be some separation in focus between the babies eyes and the mother’s face. This immediately draws the viewer’s eyes to the baby while at the same time giving the mother a softer, more caring look. Next ArticleRite of Passage: I got Malaria! What an amazing shot! I love the focus on the babies eyes! His piercing stare has the perfect mixture of longing and contentment. Assessing the unfamiliar situation with easy while in the safety of Mom’s arms. And Mom, she looks like a good Mom’s caring, comforting and nurturing!!! This is a great shot! 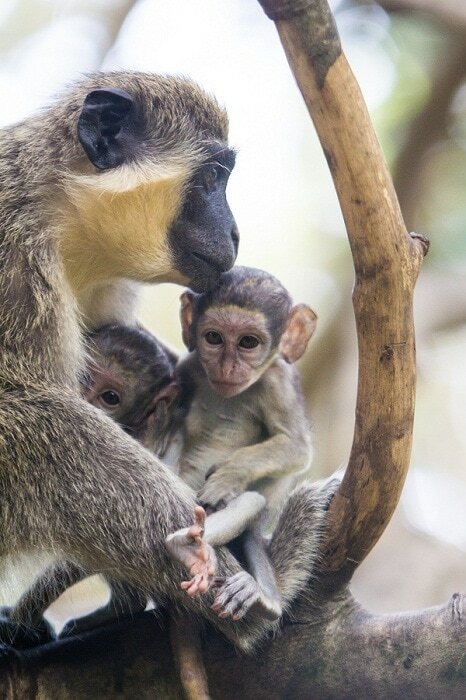 I heard that vervet monkeys are very protective of there babies, did the mother get aggressive as you got close? Mary – I think these ones are very tame since the park is well visited. The mother was pretty relaxed!